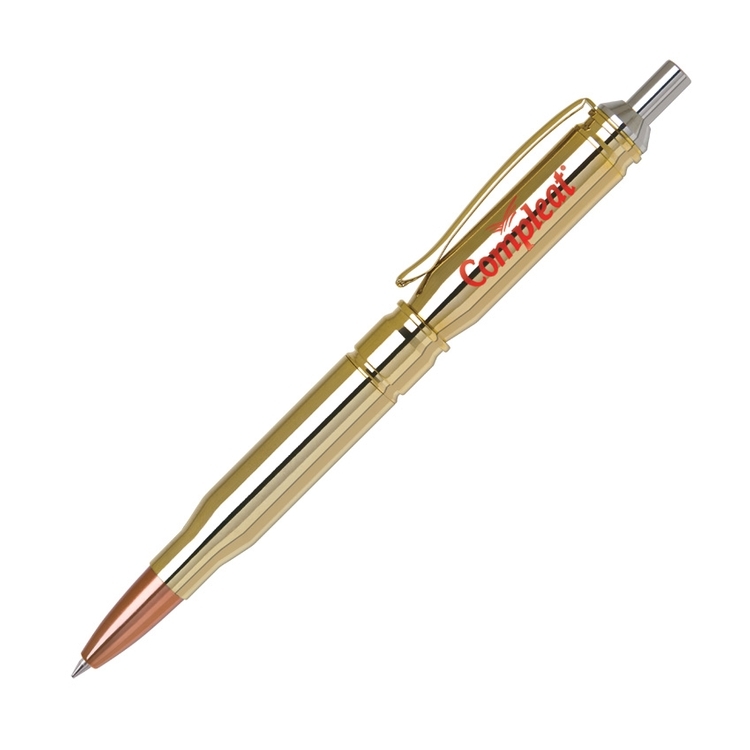 The Bullet-1 click action ballpoint pen features a solid brass construction with a polished gold plate finish and copper color points. Additional imprint options: Laser engraved cap (1 1/8"Wx5/16"H) or laser engraved barrel (1 1/8"Wx5/16"H). Affordable wood matching twist action pen and pencil set with class. 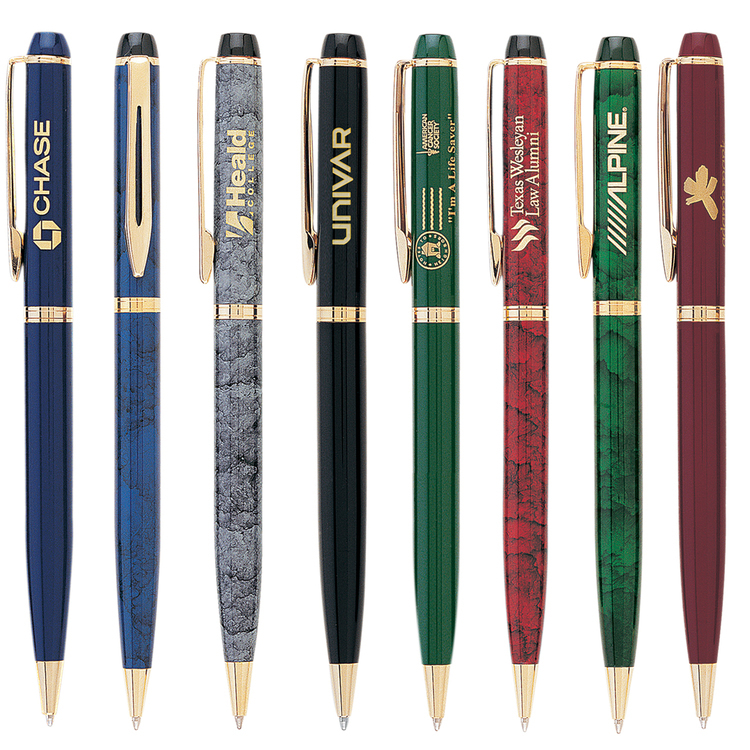 Add personalization to the pen and pencil for a truly memorable gift. Substitute a letter opener for the pencil at no charge (walnut or rosewood only). Available in walnut, rosewood or maple. These solid wood boxes with brass hinges are precision milled to each instrument. The black, blue, navy blue or burgundy flocking inside the lid adds protection and value. 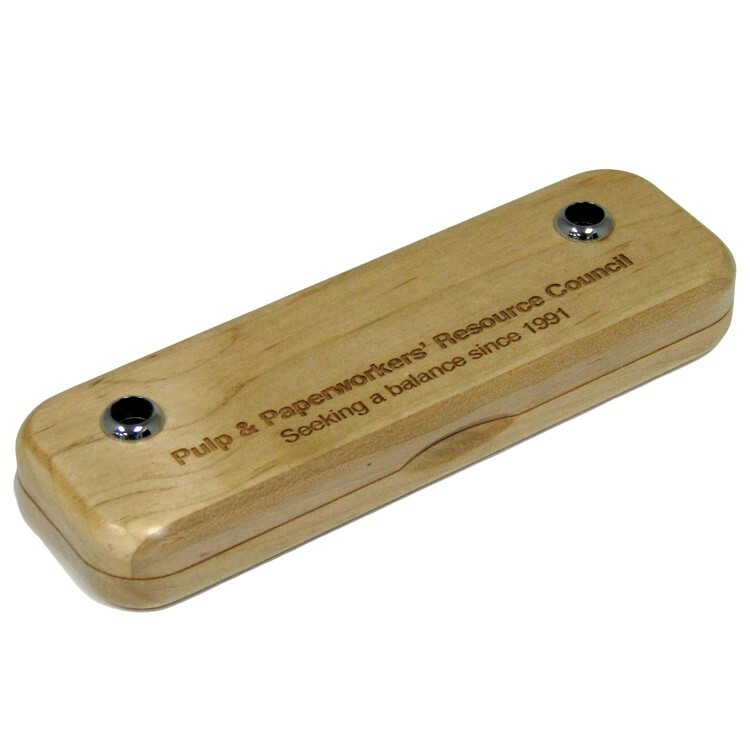 Don't forget that individual names can be laser engraved into the matching wood instruments for that added personal touch (additional charge). Available in walnut, rosewood or maple. Substitute a letter opener for the pencil at no charge (walnut or rosewood only). 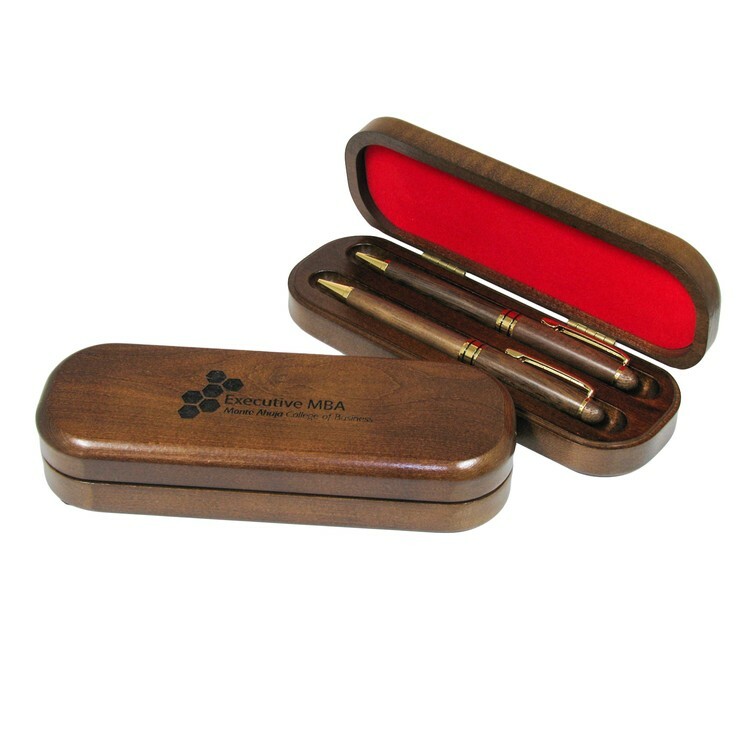 Affordable wood matching twist action pen and pencil set with dual stands in the lid. 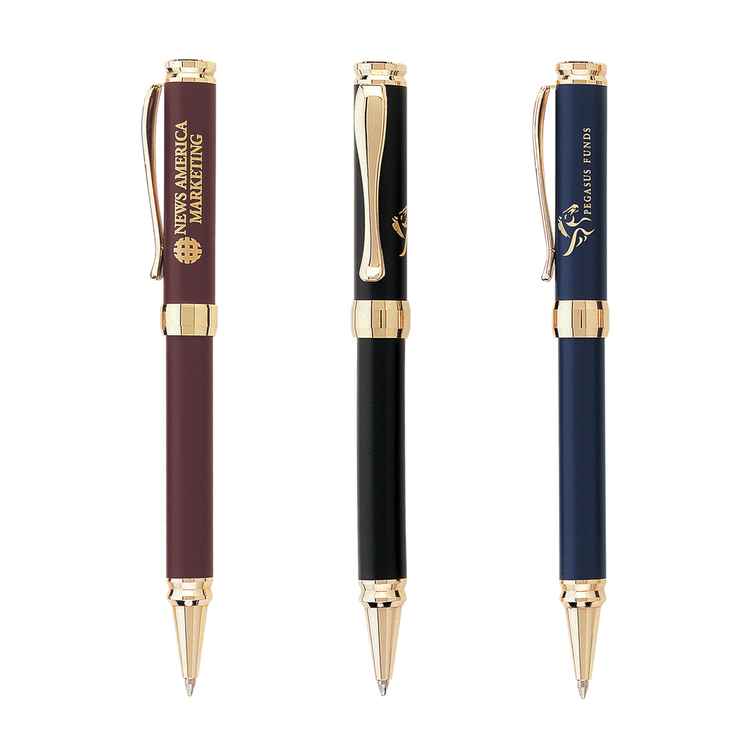 Add personalization to the pen and pencil for a truly memorable gift. Available in walnut, rosewood or maple. 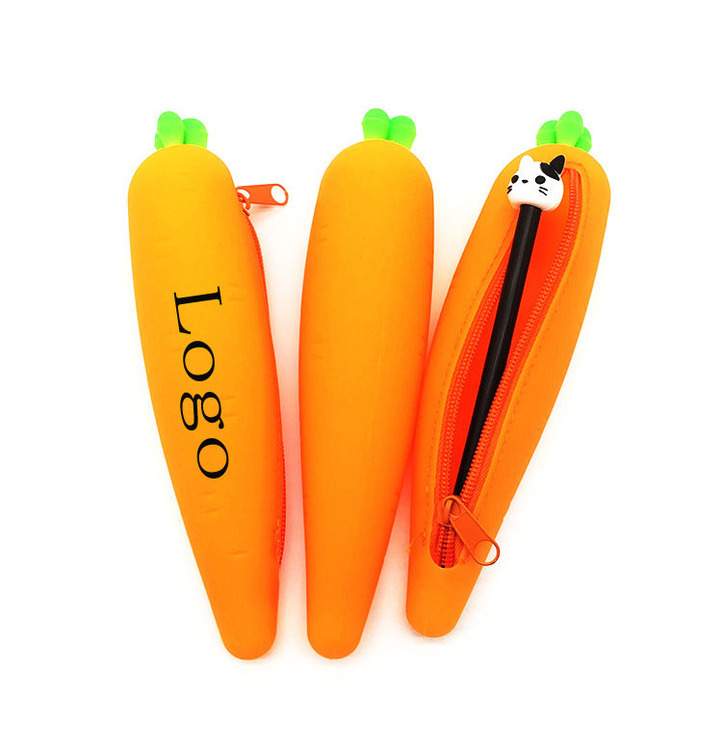 This pencil/coin case is made from soft silicone material with a beautiful Carrot shape, water proof, non-toxic and portable. You can put coins, lipstick, pencils and more in it, practical and fun. Perfect for schools, farm advertising and supermarket promotion. Hot saled office/Bathroom lastic desk pen/Toothbrush holder container. 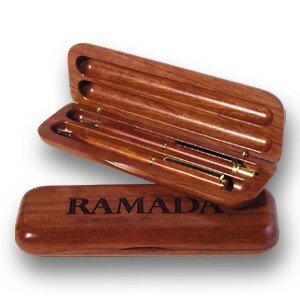 Holds pens, scissors, letter openers and other office accessories. 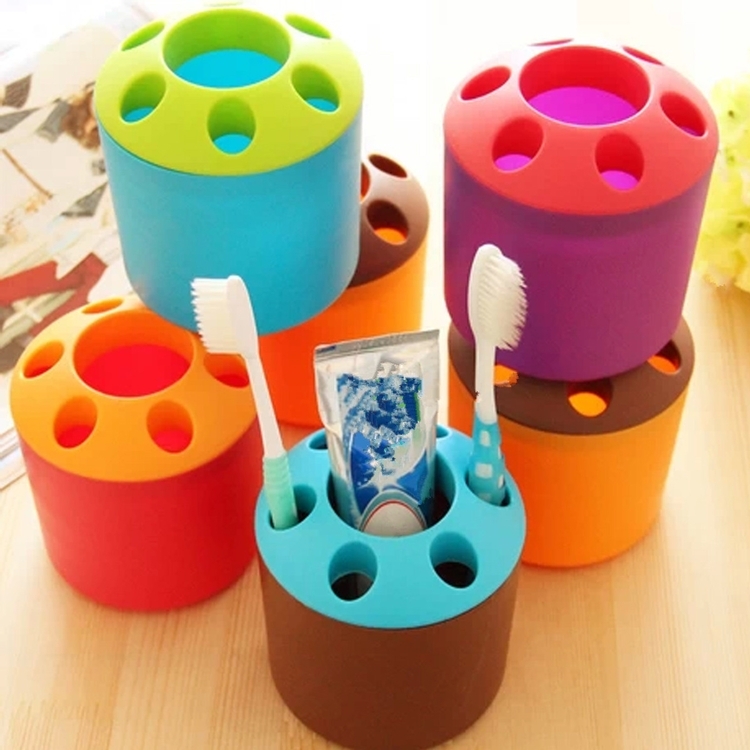 It also can be used as organizer in washroom. 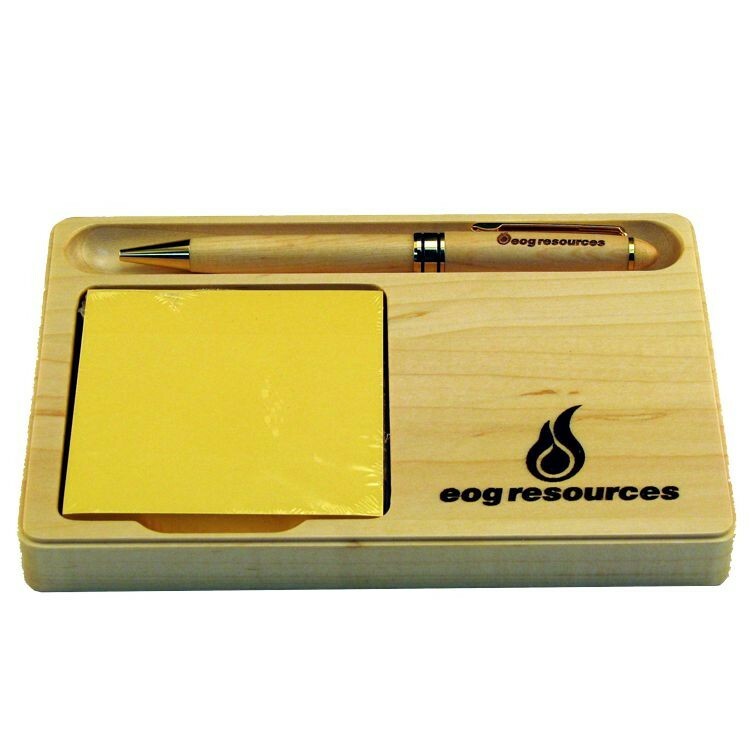 Ideal for environmental campaigns, tradeshows, bookstores and gift shops. Custom logo are available. 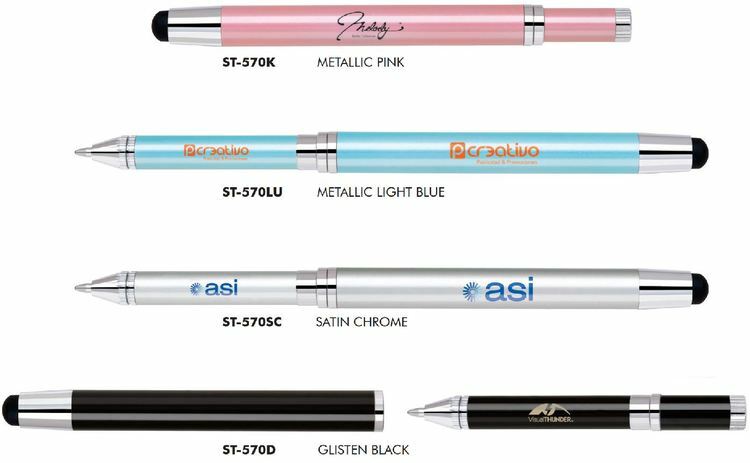 The Stylus-457 click action, aluminum, ballpoint pen with gun metal barrel and textured middle ring. Works on all capacitive touchscreen devices. Additional imprint options: Laser engraved cap (1 3/8"Wx5/16"H) or laser engraved barrel (1 5/8"Wx5/16"H). 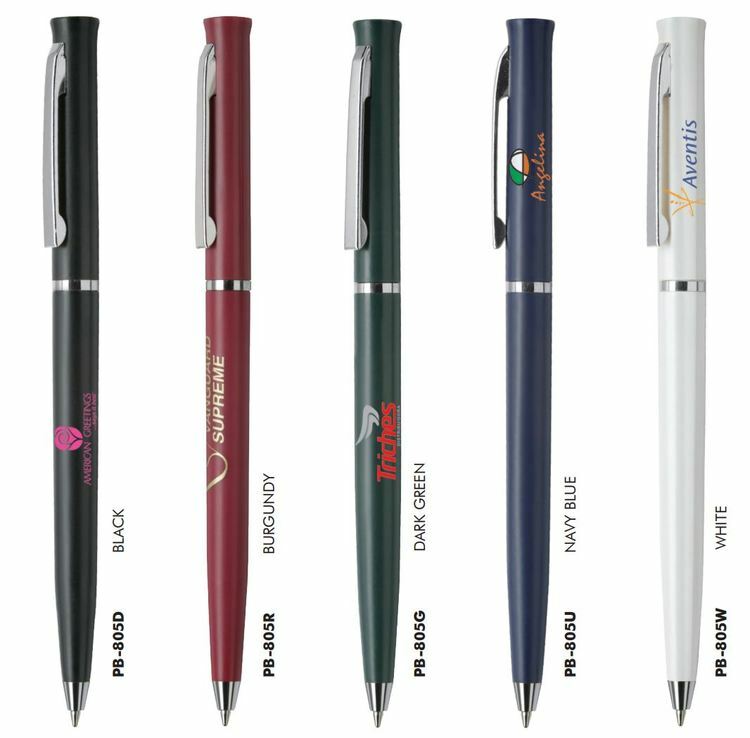 The Stylus-70 cap off ballpoint pen and stylus features a bamboo barrel, silver cap and is fully compatible with all capacitive touchscreen devices. 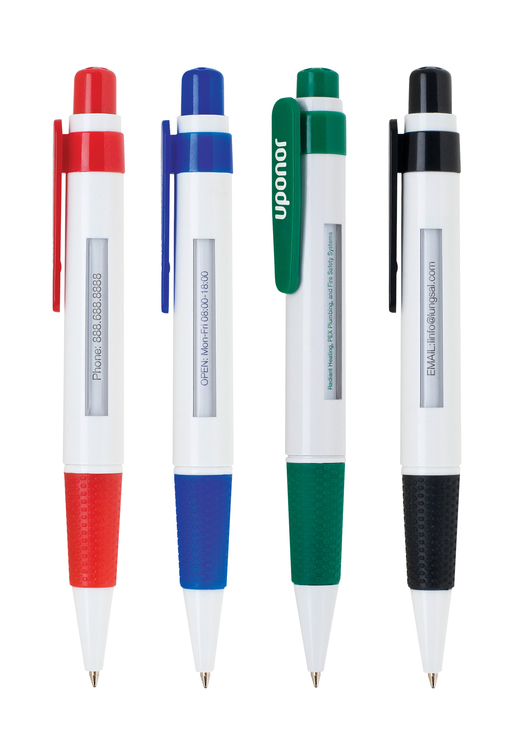 Additional imprint sizes & locations: Pad printed cap (7/8"Wx5/16"H) or laser engraved barrel (2 3/4"Wx5/16"H). 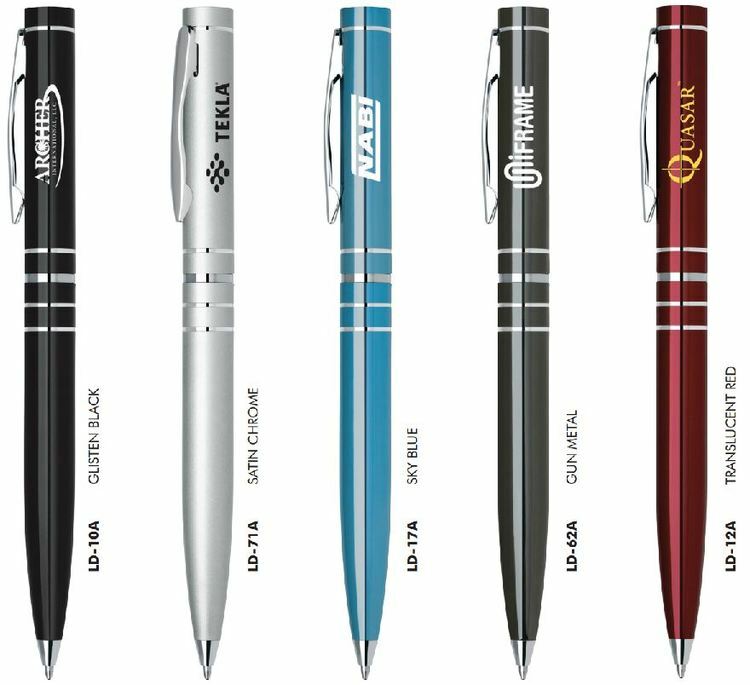 The Stylus-455 is a sleek anodized colored aluminum click action ballpoint pen with a textured grip and a rubberized tip that works on all touchscreen devices. 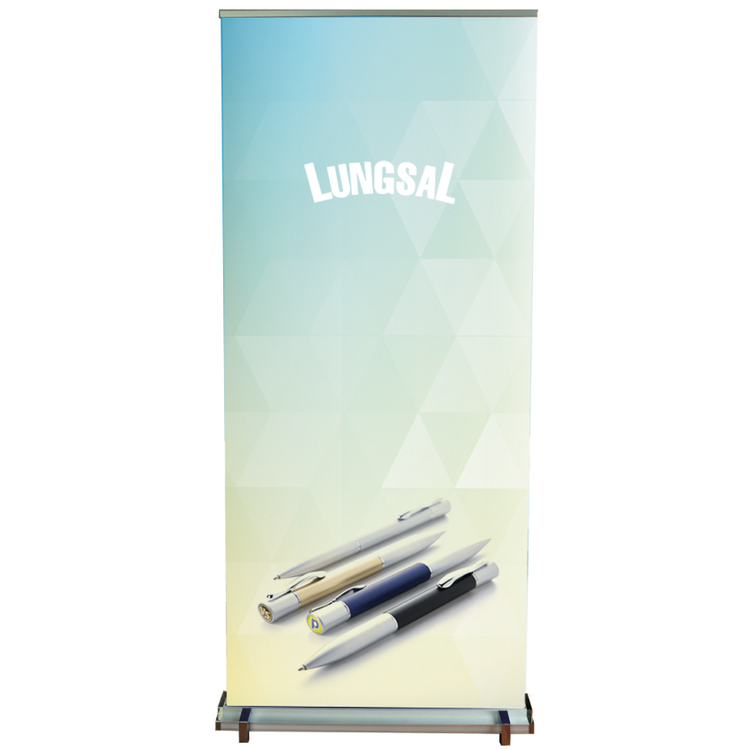 Luxury retractable banner with standard vinyl banner. Elegantly designed with classy metal base. 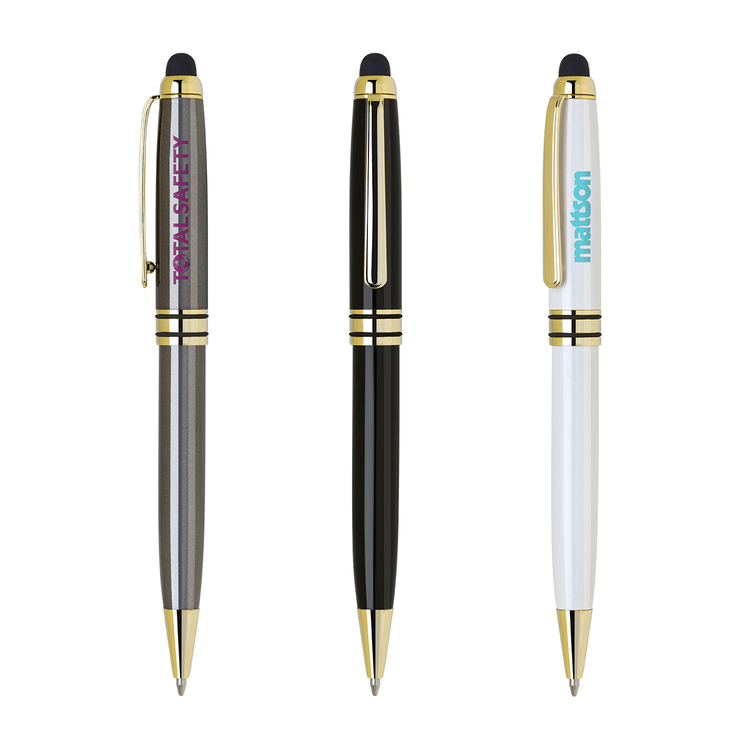 The Norman twist action aluminum ballpoint pen features a metallic colored barrel with a black middle ring and gold accents. Additional imprint options: Laser engraved cap (1 1/4"Wx5/16"H) or laser engraved barrel (1 1/2"Wx5/16"H). The Titan-I twist action heavy brass ballpoint pen features a slanted chrome tipped cap and a stylish wire-woven design on the barrel. 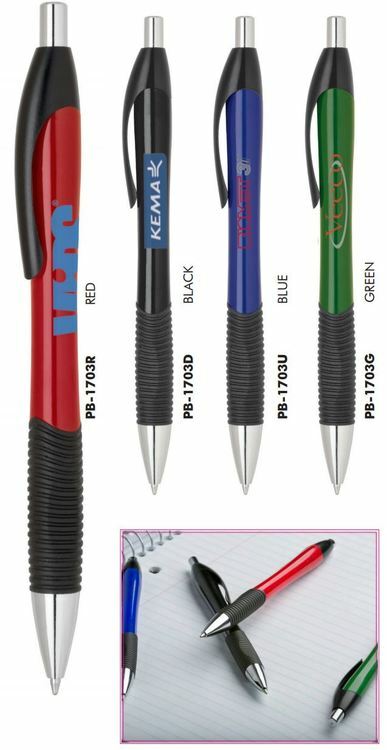 Additional imprint options: Laser engraved cap (1 1/4"Wx5/16"H) or laser engraved clip (1"Wx3/16"H). 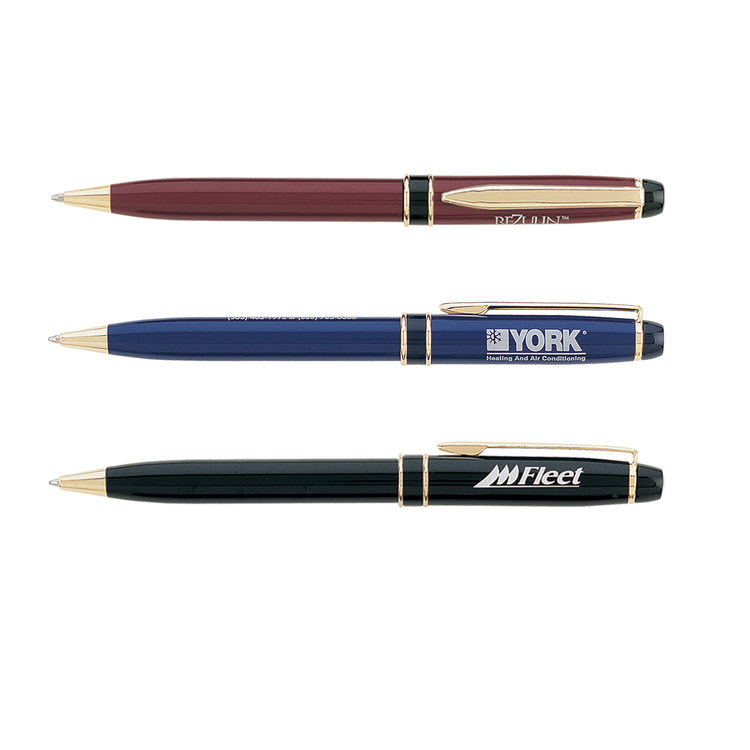 The Inca-45 click action ballpoint pen features a matte lacquer finish and a gold clip with gold accents. 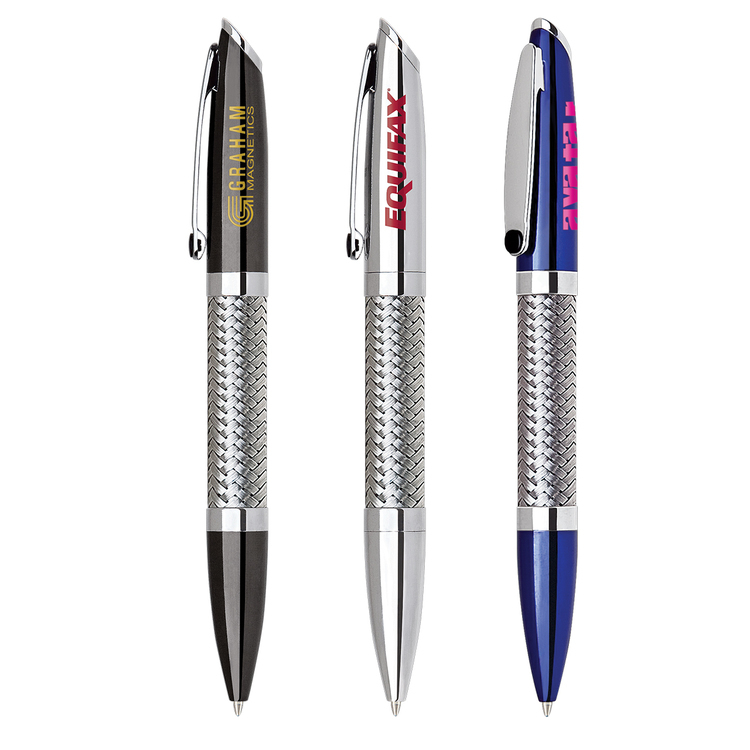 The Gemini twist action ballpoint pen features a comfort rubber grip and polished chrome accents. Our Single Pen Cardboard Boxes are the most simple and straightforward way to package pen gifts and gift pencils. Comes in Satin Gold coating. The stylish Plantagent-1703 click action plastic ballpoint pen features a solid colored barrel, a coordinating black rubber grip and a chrome tip. 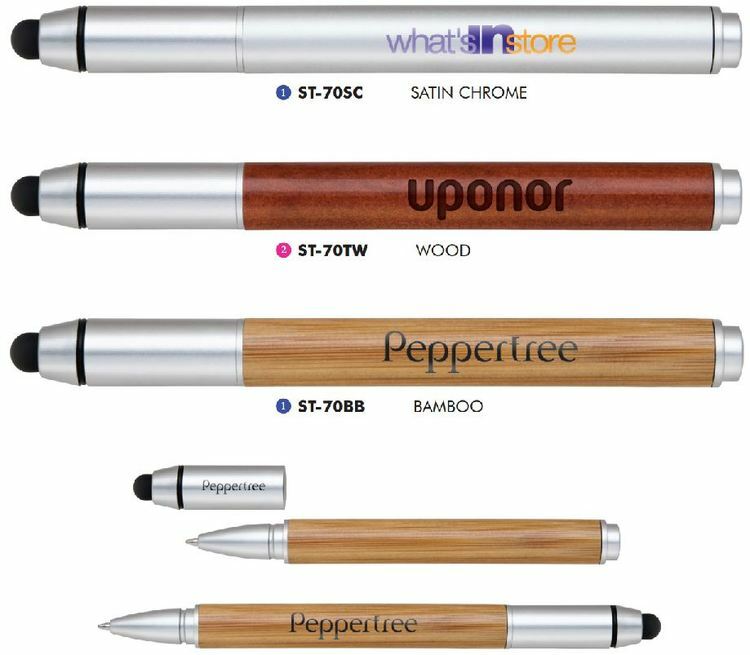 The Terrific Timber-4 twist action ballpoint pen features a wooden barrel, a silver middle ring, and a silver pocket clip and tip. 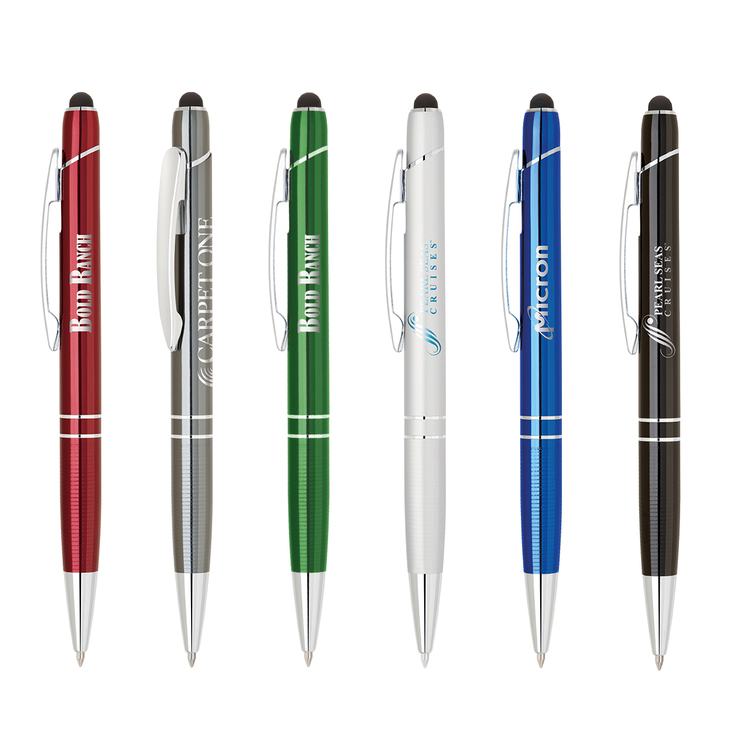 The stylish Plantagent-805 click action plastic ballpoint pen features a translucent colored barrel with a split ring and a chrome button. 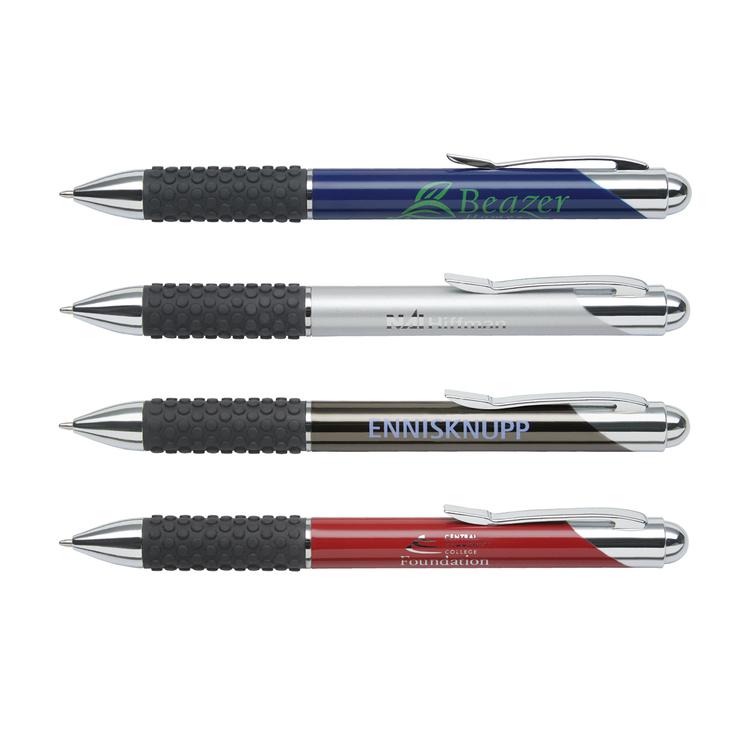 The Legend-III twist action aluminum ballpoint pen features a bright, colorful high polished barrel with a shining chrome clip and shining chrome accents. Additional imprint options: Laser engraved cap (1 1/2"Wx5/16"H) or laser engraved barrel (1 1/2"Wx5/16"H). 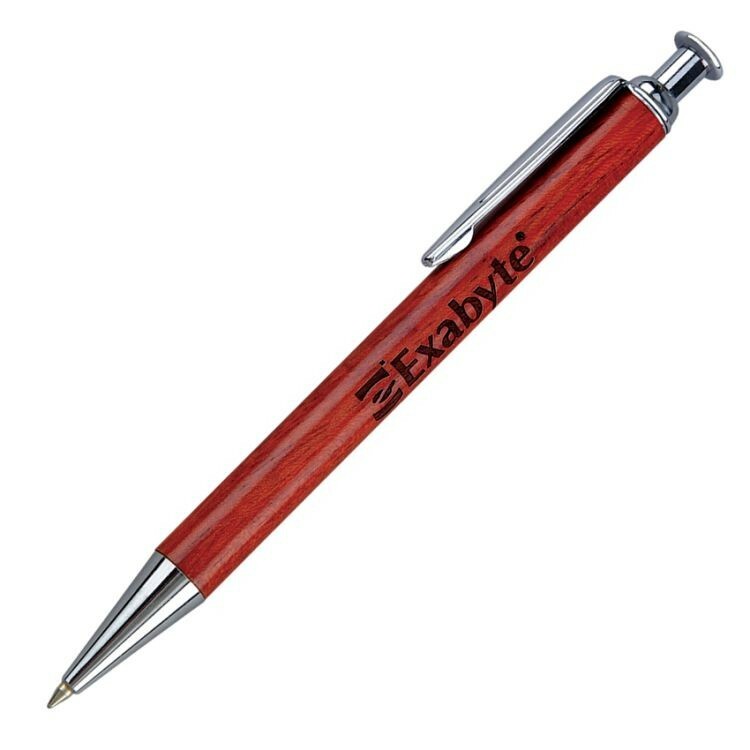 The Wooden Stylus twist action ballpoint pen and stylus features a checkerboard designed, two-toned, barrel in maple and rosewood hues and is fully compatible with all capacitive devices. Contact-Free RFID Cards made of PVC. List of chips available: Acculock/ BeLine/ Be-Tech/ Kaba/ ILCO/ MIWA/ Onity/ Orbita/ Saflok/ SALTO/ SecureLox/ Tecage/ Ving Card. 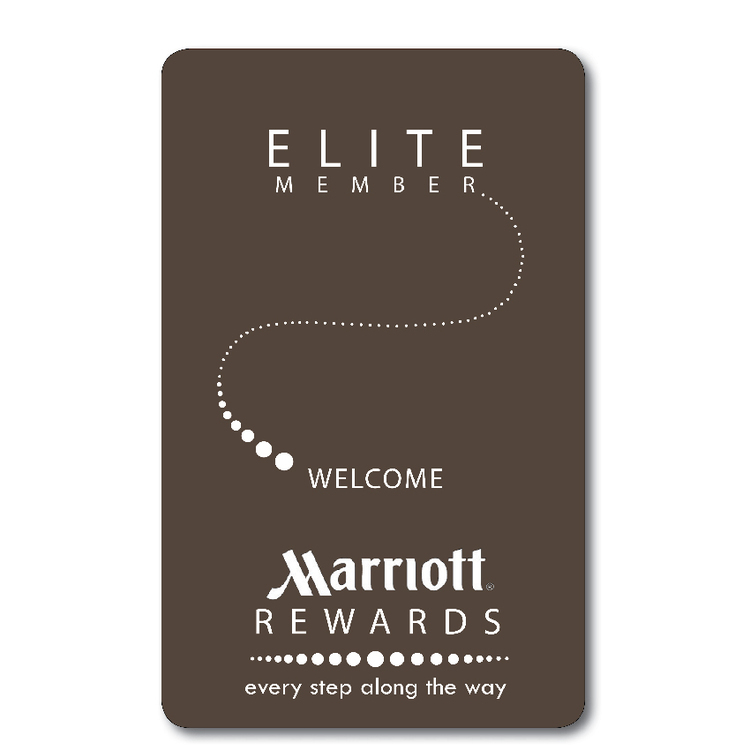 Lungsal can also custom encode any RFID card not listed above upon receiving 2 RFID card sample. 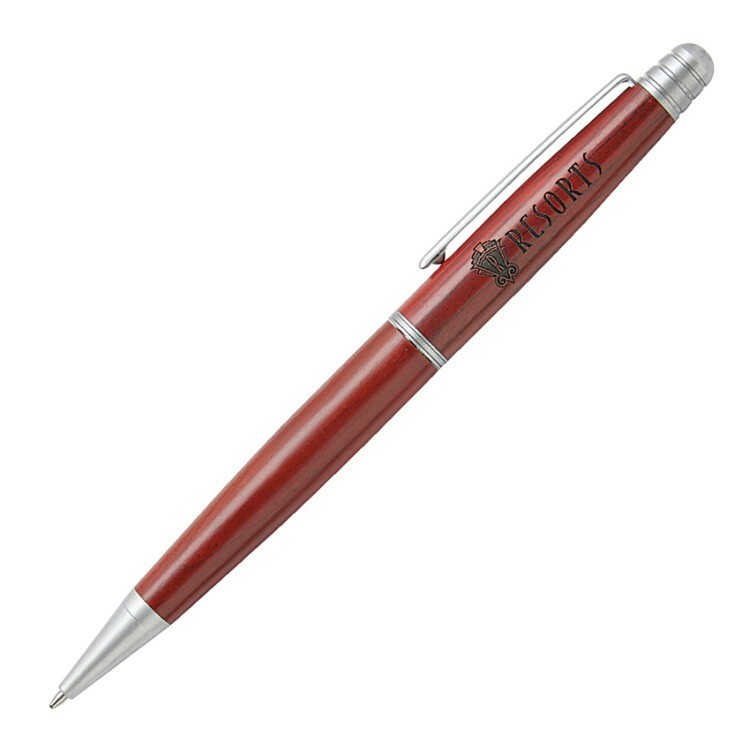 The Terrific Timber-7 click action ballpoint pen features a wooden barrel and silver accents. 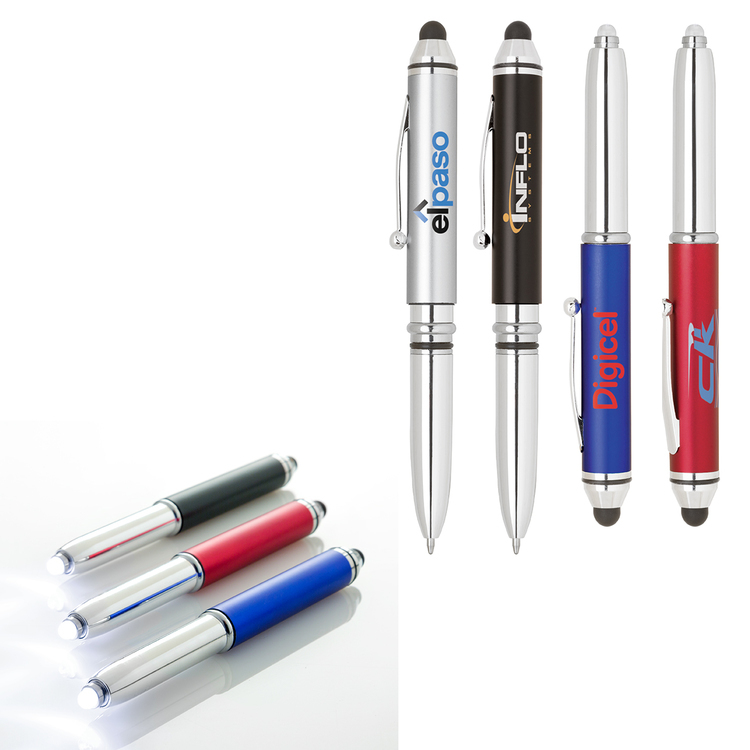 The Stylus-402 cap-off, 3 in 1 ballpoint pen, stylus and L.E.D. flashlight features a convenient plastic body available is bright metallic colors and is fully compatible with all touchscreen devices. The Carolingian twist action ballpoint pen features a marble colored or glisten enamel coated barrel with a gold clip and accents. Additional imprint option: Laser engraved cap (1 3/4"Wx1/4"H) or laser engraved barrel (1 3/4"Wx7/8"H). 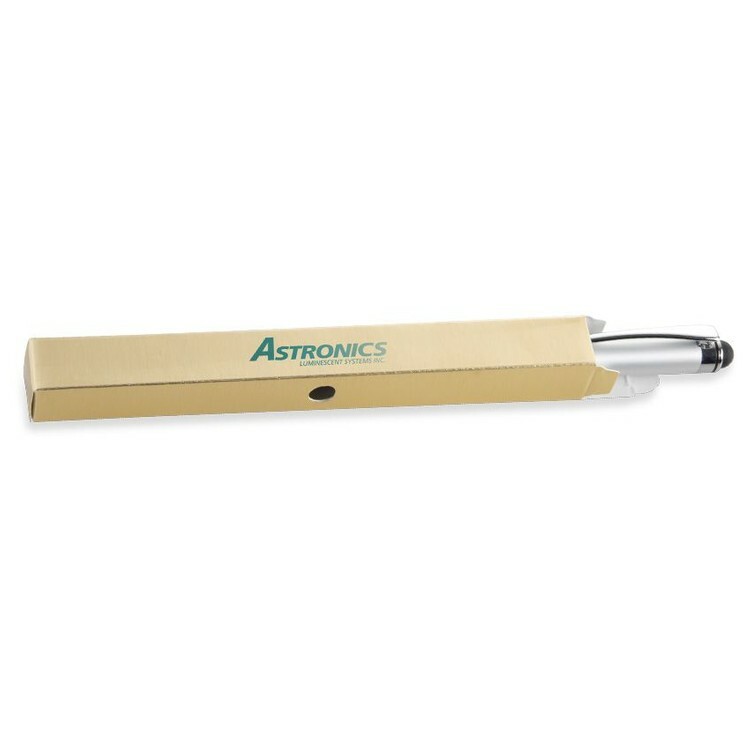 The Stylus-480 heavy weight, brass, ballpoint and stylus is fully compatible with all capacitive touchscreen devices. Additional imprint options: Laser engraved cap (1 5/16"Wx5/16"H) or laser engraved barrel (1 5/16"Wx5/16"H). 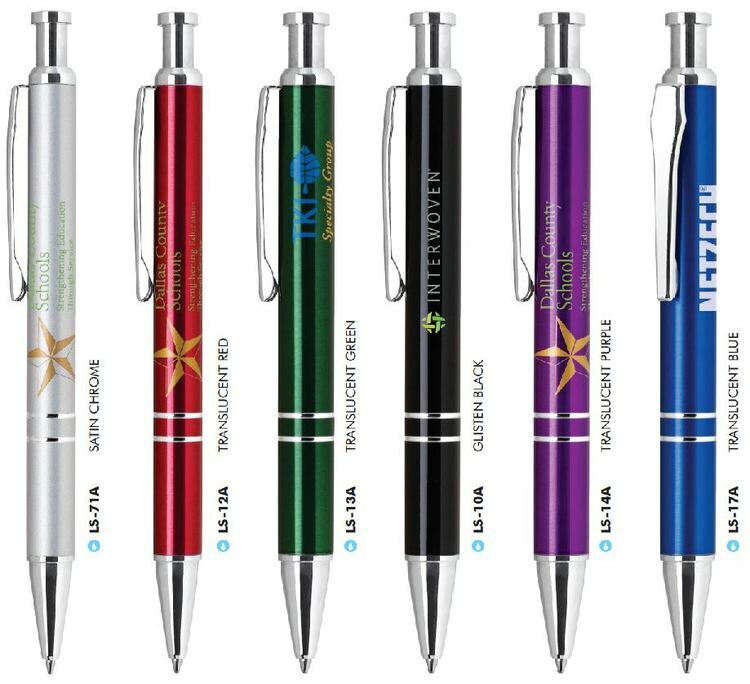 The Stylus-570 dual action, cap-off ballpoint pen and stylus features a cool metallic color finish and is fully compatible with all capacitive touch-screen devices. Additional imprint options: Pad print cap (2"Wx1/4"H) or pad print barrel (1 3/16"Wx3/16"H) or laser engraved cap (2"Wx3/16"H). 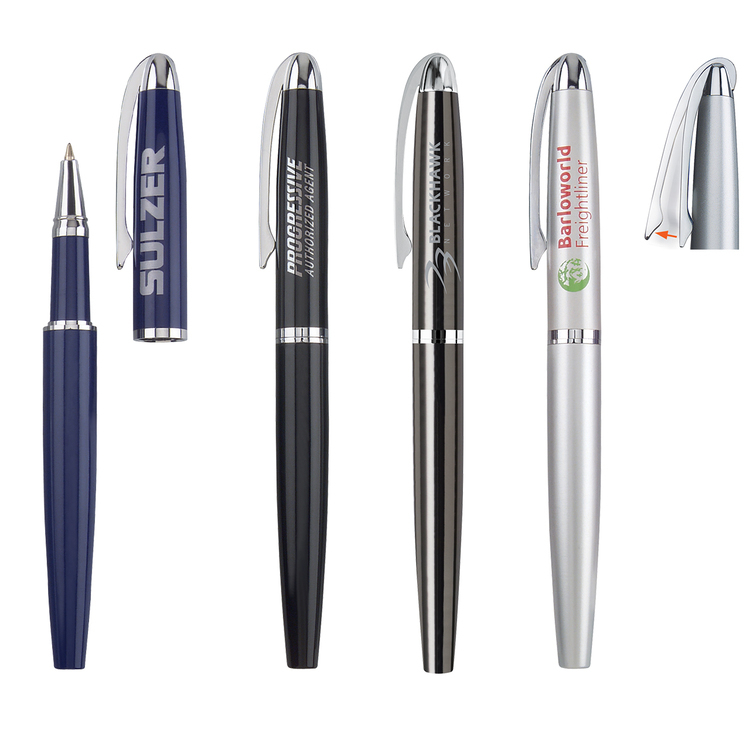 The Luster click action aluminum ballpoint pen features a sleek metallic colored barrel with shining silver accents.